What materials do East Lincs Recycling Waste Management recycle? We can recycle most commercial and industrial wastes, separating out paper, cardboard, plastic, glass, wood and metals. What type of service can you provide? We provide a full portfolio of waste management services, please contact us for more details. East Lincs Recycling services run throughout the Lincolnshire area. Through company partnerships the company can provide a nationwide waste management solution. Should you require further information, please contact us. The special relationships we have built up with mill groups across the globe enable us to maintain outlets and competitive pricing on bulk loads, for cardboard, polystyrene (EPS), all grades of paper and plastics including PP woven sacks. 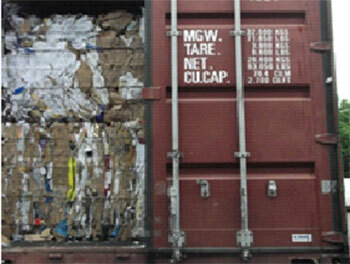 All materials are collected and shipped in accordance with UK, European and Global Regulations. Containers can be arranged for specific days and times, allowing you to manage your operations more effectively. We aim to maintain the highest levels of service and quality and you can be assured that materials are only shipped to accredited facilities. We encompass the UK and always welcome the opportunity to discuss your requirements first-hand.